A new Construction Service Law No. 2 of 2017 (“New Construction Law”) was enacted in Indonesia on 12 January 2017 which replaces Law No. 18 of 1999 concerning Construction Service (“Law 18/1999”). The New Construction Law is more comprehensive than Law 18/1999 as new provisions are added in order to complement and correspond with existing laws and regulations such as Manpower Law, Information and Electronic Transaction Law, and Regional Authority Law. The implementing regulation of the New Construction Law has yet to come into force, which shall be enacted no later than 2 years from the issuance of the New Construction Law. Current implementing regulations remain valid so long as they are not inconsistent with the New Construction Law. However, Law 18/1999 did not stipulate further the general and specialist classification and the scope of business activities of each type of construction business. 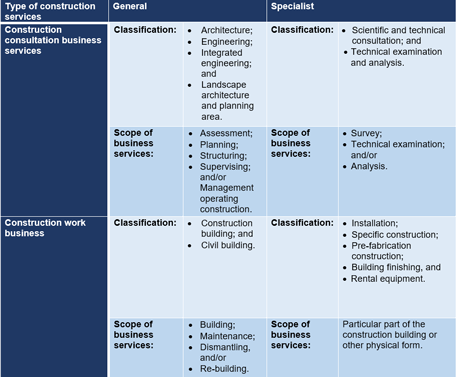 With regard to the integrated construction services, there are 2 types of classification, namely building construction and civil construction. The scope of business services are (i) building plans, and (ii) engineering, procurement, and execution. Please note that the New Construction Law also requires construction service providers to prioritize domestic production. construction work contracts need to be in the Indonesian language. Where a foreign party is involved however, the contract will need to be both in the Indonesian and English language. In the event of a dispute, the contract which is in the Indonesian language shall prevail as the governing language. Further regulations on this will be made in the Government Regulation. The New Construction Law has expanded the way building supply business (usaha penyediaan bangunan) service can be conducted i.e., through cooperation between central government and/or regional government and the business entities and/or community. The provisions related to the contract on building supply shall be further regulated in the presidential regulation. The construction service user is responsible for all construction service costs based on the construction work contract, which is evidenced by the ability to pay (i.e. financial capability statement from bank or non-bank institution) and/or commitment upon procurement of construction service product (i.e partnership agreement). The New Construction Law classifies the qualification of the construction workers to be (i) operator, (ii) technician or analyst; and (iii) expert. Construction workers must undergo a competency test organised by a certified institution that is registered with the Ministry of Public Works, to obtain a decent remuneration. The Government of Indonesia is planning to create integrated system information in order to provide an accurate and integrated data and information in conducting construction services. In this respect, the user and provider of construction services are obligated to provide data and information to this system regarding responsibilities, authorities, development and service duties conducted by central and local government in the construction service field. The New Construction Law removes the criminal sanction, which was previously regulated in the Law 18/1999, and only imposes administrative sanctions, such as, written warning, administrative fee, temporary suspension of the construction activity, blacklisted, and accreditation suspension and revocation. If you have any questions or require any additional information, please contact Afriyan Rachmad, Evi Pasaribu, Sianti Candra or the ZICO Law Partner you usually deal with.